The Resistor Wallet from Evil Mad Scientist « Adafruit Industries – Makers, hackers, artists, designers and engineers! Many of our soldering kits have multiple resistor values, but the Three Fives kit is unusual among our projects in having nine individual resistors of different values. This presented an interesting problem: how to make user friendly packaging to make it easy to find the right resistor. Sure, you can read the color code stripes, but that can be a pain for folks with color blindness or just plain old poor vision. 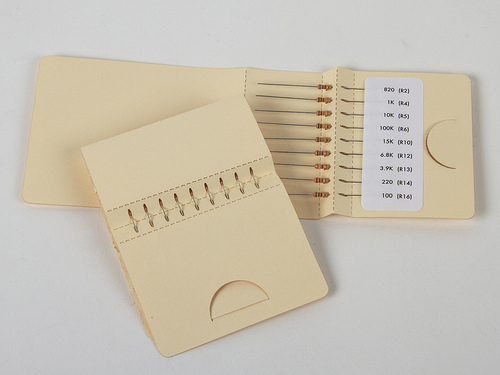 Our solution was to design a custom wallet, modeled after needle packets, to hold and label the resistors with their locations & values. 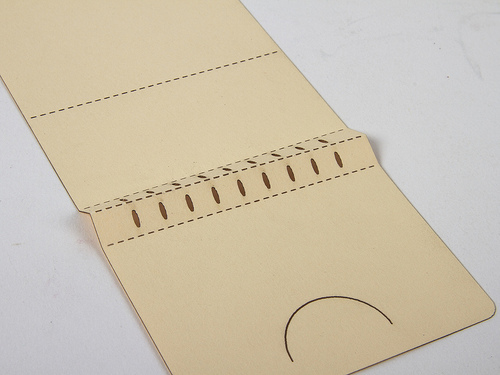 The resistors are dropped into slots, secured with a label, the cover flap is closed over them and then tucked under a tab. During use, each resistor is simply pulled out from under the adhesive label.